In 1952, five men sitting around a bar casually mentioned to one another their interest in sports cars and as things will go, came to a mutual agreement to have a gathering of those interested in sports cars. In late summer, early fall of 1952 Art Bennett, Bob Baird, Eddie Haas, Bill Rapier, and Al Wintringham started spreading the word. Bill and Eddie were sub dealers for M.G. under the Monterey British Auto dealership and owned a gas station in Seaside. Eddie was rumored to be one of the best bartenders on the Monterey Peninsula. Art owned a market in Pacific Grove. Bob was a Porsche, Volkswagen, Mercedes, and Panhard dealer, and Al was a sports car nut of many years. The first meeting of the Pebble Beach Sports Car Club (PBSCC) was held at the Casa Blanca bar, about 20 guys attended and it was considered a success when everyone tossed fifty cents into the kitty to start the first treasury. Subsequently officers were sort of elected with Bill Rapier as President and Bob Baird as Marshall. Bob’s first assignment as Marshall was to stage a Rallye. One of those present at this meeting was Holly Hills from the Navy School who gave demonstration rides in his M.G. TD. This consisted of driving as fast as he could and making 180-degree hand brake turns. Since car clubs in the United States were relatively new (The SCCA was formed eight years earlier in 1944), no one had any idea of what a sports car Rallye was all about. Larry Rose, a former city manager of Carmel, and another original member, had a magazine from England with a story about a Rallye run in England. After reading this article, Bob became an instant “Rallye Expert”. This resulted in the first PBSCC Rallye, held on August 22, 1952. Bob laid out the course which started at the Casa Blanca (where else? ), went out Salinas Highway, over the old Los Laureles grade road, west on Carmel Valley to Highway 1, and south down the coast to Rocky Point Lodge. Rocky Bowersox, the builder and proprietor of Rocky Point Lodge, was another original member. Even with this simple course, several people got lost. All but one eventually got to the Lodge. The one who did not was a guy that owned a bar and had an M.G. that he had mounted a loud speaker on and would yell out advertisements for the bar as he drove. The attitude toward people who drove sports cars in those days was about the same as toward those who rode Harley’s. This made it difficult to run many events, which led to picking places in out of the way locations. An early member, Greg Teaby, who was the Fire Chief in Monterey, thought it would be a good idea to have a Hillclimb. He convinced the city to grade the road at the west end of Harrison Street that ran through a park. The Highway Patrol heard about it and put a stop to it because no “Speed Events” could be held on a public roadway. Later a Hillclimb was established on a ranch outside of King City on private property. Some of the cars in the early years were MG TDs, TCs, TFs, Sunbeam Talbot, Morris Minor convertible, Frazer Nash, Horst, Ferrari, Arnot Bristol, several Porsches, three Morgan Three Wheelers, a Panhard roadster, a Devin Panhard, and a Jag 120. Meeting places changed, Casa Blanca to Pacific Street Hall, Pacific Street Hall to Pebble Beach, Pebble Beach to Casa Munras, Casa Munras to Mark Thomas, Mark Thomas to the Outrigger, and finally to the La Playa. By-laws were instigated by Holly Hills and the club was incorporated in 1953 with the able assistance of Attorney E. Whittlesey of Carmel. The first year of the club saw the beginning of the traditional Christmas party with Holly Hills as M.C. Gymkhanas were favorites during the early years as were tours and races. Bob Baird first laid out the Nacimiento Rallye. This Rallye went south down the coast to Nacimiento road. Nacimiento road was dirt all the way to the top of the grade and down into Hunter Liggett. From there paved roads alternated with gravel roads. Drivers had to ford the river twice before arriving at the Hunter Liggett headquarters. From there a dirt road went northwest to the Indian campgrounds where the drivers checked in and had lunch. This Rallye was delayed in the spring until the road over Arroyo Seca was opened, and there were still problems. One year, Bob drove the road a week prior to the Rallye and all was right with the world. The day of the Rally a section of a hill had caved in and blocked the road. Somehow Bob and a fellow who happened to be on the other side managed to lay a track over the slide and the Rallye continued. The road over Arroyo Seca was all dirt and mud until you arrived at the Arroyo Seca campgrounds. From there to Carmel Valley Village, the final section of the Rallye, the road was paved. The main complaint with this Rallye was the amount of time it took to clean the cars afterward. 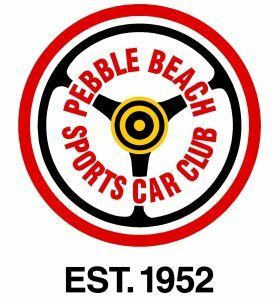 Fast forward to 1996: The Pebble Beach Sports Car Club is a group of car enthusiasts with interests in all types of sports cars, racing, and socializing with the specific and primary purpose of promoting safe and skillful driving. There is no particular featured marque that makes this a unique car club. As the years went past, PBSCC membership declined and PBSCC stopped functioning as a club but never ceased to exist. Esther Carlyle who was the last elected treasurer, kept the corporation intact by paying the yearly fees to the state. In 1996, Perry Cross, a former member, started talking to people about bringing the club back to active status. There was enough interest among Perry’s friends and people that he met during the course of his work that the club was resurrected. We held a meeting and elected Perry as the first president of the resurrected club and re-elected Esther as the treasurer. We now have about 120 members. In the past, some of the more prominent Club members, Ed Leslie, Chuck Parsons, Red Geesaman, Don Wester, Rich Hilgers, Don Martine, Jack Flaherty, Fraser Sibbald, and Ole Anderson, raced at Pebble Beach, Laguna Seca and other venues, just to name a few. Today, the Club supports current members, Jim Weissenborn, Tom Morgan, Scott Brown, Bata Mataja, Bill Kirkwood, Mary Pozzi, Mike Hayworth, Frank D’Aquanno, Rob Mason, Doug Sallen, and Tom Tuttle, in their vintage racing adventures. PBSCC is now more of a social club than the sporting club that it once was. We do have a rally now and then but it’s mostly driving tours to sites of interest, car shows, and volunteer work at Laguna Seca raceway, and parties. On occasion we do an overnight tour when the site of interest is too far away for a one-day tour.